Brock Long, the Head of the Government’s Disaster Management Agency, also told CBS News that Harvey should be a wake-up call for local officials. “It is a wake-up call for this country for local and state elected officials to give their governors and their emergency management directors the full budgets that they need to be fully staffed, to design rainy-day funds, to have your own stand-alone individual assistance and public assistance programmes,” he said. The disaster should also be a wake-up call to the climate-denying President that unless he acts on climate, there will be more Harveys. It is a wake-up call to the media to accurately report the disaster, including how climate change fuelled its intensity. It is also a wake-up call to the oil industry in so many, many ways. On a national and international level it shows how our continuing dependence on fossil fuels will drive more extreme weather events. On a regional level it shows how ill-prepared the fossil fuel industry – and wider petrochemical industry – were to an event like this, despite decades of warnings. Instead the fossil fuel industry’s complacency, malaise, self-regulation and capture of the political system are all to blame too. They have led to a system of peril. Ironically, since Katrina, the US oil industry has become more vulnerable to climate disasters, rather than less, buoyed by the shale boom. The US shale industry built that infrastructure knowing that its refineries and pipelines were vulnerable to climate disasters. But short term profit always wins. Nearly half the country’s refining capacity is in harm’s way on the Gulf Coast. This capacity is vulnerable to storms, hurricanes and super-storms, all of which will become more frequent with climate change. The oil industry knew this. But they built anyway. They also knew that their refineries would cause significant pollution if they were caught up in a super storm like Harvey. But they built anyway. And only a matter of time it was. It took less than a year for Harvey to hit. One of those was Exxon’s Baytown, which “released about double the amount of volatile organic compounds—a broad category of air toxics—than its permit normally allows”. Shell also shut down its Deer Park refinery, releasing excess amounts of the cancer causing chemical benzene, amongst others. Schlanger adds: “In industry parlance, these pollution spikes are called ‘exceptional events’. The excess pollution is considered an emergency necessity to prevent worse outcomes, like an explosion, so plants are exempt from fines they would ordinarily pay for exceeding their legal pollution limits.” So the system allows the industry to poison the local population even more in times of trouble. As Harvey’s rain intensified, some refineries in the path of the storm began to flare excess chemicals, directly impacting the poorer, Latino communities in Houston’s East End. At the height of the storm, the local communities were reporting strong gas and chemical-like smells. “I’ve been smelling them all night and off and on this morning,” Bryan Parras, an activist at the grassroots environmental justice group TEJAS, from Housten’s East End, told the New Republic. 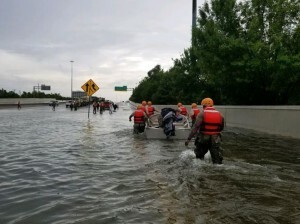 Parras added said some residents were experiencing “headaches, sore throat, scratchy throat and itchy eyes.” But due to the rising flood waters, the residents were trapped, breathing in the toxic air. “Fenceline communities can’t leave or evacuate so they are literally getting gassed by these chemicals,” Parras added. Nor was it just refineries. The Associated Press has explored Harvey’s impact on toxic Superfund sites, a legacy of the oil and gas industry, of which there are dozens in the Houston area. The AP “surveyed seven Superfund sites in and around Houston during the flooding. All had been inundated with water, in some cases many feet deep”. Later the Environmetnal Protection Agency would confirm that over a dozen sites had been damaged. Then of course we have had the wide petrochemical plants, one of which exploded last week. The response from the company was to let it “burn itself out”. Where, you might well ask, was the emergency plan to prevent this happening? Two years ago, the local newspaper, The Houston Chronicle documented the total lax safety standards of the petrochemical industry in the state in a must-read eight-part series. At the time, Ron White, the former director of regulatory policy at the Center for Effective Government, told the paper that “It will take another disaster” before the authorites started to reign in the petrochemical industry and take pre-emptive action. That disaster has now happened. Now is the time to act. Before another storm hits.